Return Gmail to an inbox that shows all messages simply ordered by date. Simple and Elegant Trumps Smart and Baroque? An inbox is an inbox—and not two or five. Why let Gmail filter out some messages to special tabs when all that adds is at least one more click to make? If you prefer your Gmail inbox elegant and simple, you can disable inbox tabs in reasonably simple a manner. All messages previously found only on tabs will appear under Inbox then. 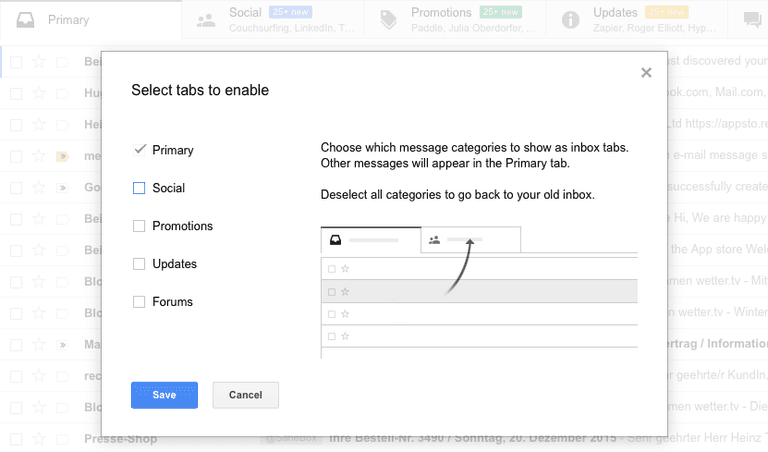 Select + next to the rightmost tab in your Gmail inbox. Make sure only Primary is checked under Select tabs to enable. Uncheck Social, Promotions, Updates, and Forums. Did You Know Smart Labels Can Automatically Sort Messages in Gmail?